In my attempt to spend time learning to do, and doing, things I enjoy in life, I signed up for a knitting class! We had our first of four meetings this past Monday. I’ve known how to knit since I was a kid, but never actually produced anything useful. After a few attempts (and many unread/overdue library books) to teach myself, I decided to sign up for a “knit your first sweater” class at the yarn store downtown. Nervous? Yes. I could barely remember how to cast on! Luckily it is a small class and Barb, our teacher, is very patient. We knit our gauge swatches to make sure we were on the right track, then got to work knitting the back of our sweater! I only have about 4 inches done right now, but my comfy purple sweater(vest) is on it’s way to being a reality! If you’re so lucky I might post pictures eventually. I’m feeling accomplished, and like my sweater style may greatly increase in the next few years. 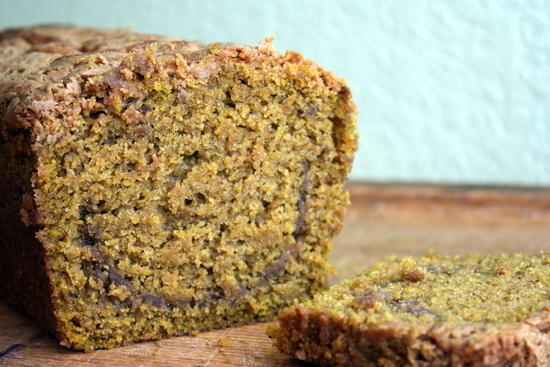 Before heading to knitting class, I made this loaf of pumpkin peanut butter bread – whoa. I am, admittedly, not a huge fan of peanut butter in baked goods. Feel free to disown me now. I’ll eat it by the spoonful, or on sandwiches, but I will almost never jump for a peanut butter cookie or chocolate peanut butter pie. Despite my lack of enthusiasm for baked peanut butter, this bread is awesome! I never turn down pumpkin, and the addition of peanut butter makes it a salty and sweet combo of the best kind! I considered slathering peanut butter on a slice of the finished product, but decided to hide my totally gluttonous side from you for now. 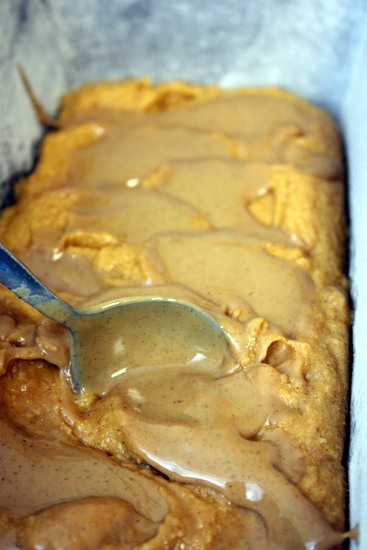 This pumpkin peanut butter bread is a new take on pumpkin bread, swirling in deliciously smooth peanut butter! Preheat oven to 350 F. Butter and flour a 9×5 inch loaf pan. In a bowl, sift together flour, pumpkin pie spice, baking soda, baking powder, and salt. With a mixer, cream butter until smooth. Add sugar and mix until smooth. Add eggs, one at a time. Add pumpkin puree, then vanilla extract. Alternating with the milk, incorporate the flour mixture to the pumpkin mixture and stir until combined. Melt peanut butter in the microwave until it is runny, but not too hot. 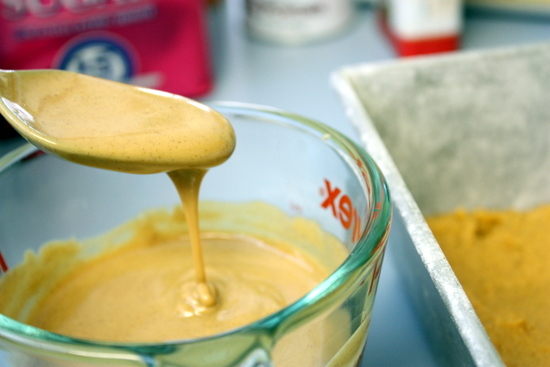 Spread 1/2 of the pumpkin mixture into the prepared pan, then liberally pour peanut butter over the batter. Using a knife, marble the peanut butter into the pumpkin batter. Spread remaining pumpkin batter into the pan, and top with the rest of the peanut butter (again, marble with a knife). Bake for 55 minutes, or until a cake tester comes out clean. I used whole wheat pastry flour for this recipe (because it was on sale!) and it turned out wonderfully. The less sugary the peanut butter, the better. About 2/3 of the peanut butter mixture should go in the middle of the loaf, and the other 1/3 on top, but you can really put it throughout however you want. You could layer it, totally mix it together, inject it… the possibilities are endless! Looks good and sounds as if it could be a Derek favorite! Glad the knitting class went well. The bread is phenomenal! A perfect Fall treat!